Bob ran the 26th Marathon Des Sables, a multi-leg, self-sufficiency ultramarathon run annually in southern Morocco. 950 competitors effectively ran 6 consecutive marathons (151 Miles/243 km) in 6 days across the Sahara Desert and over a variety of terrain including sand dunes, gravel fields, salt flats and mountains. They call it the toughest footrace on Earth. The maximum day –time temperature was 54.5C (130 Fahrenheit) and the night-time low was below 10C. Bob applied to run the MDS, paying a hefty deposit, over 3 years ago. All of the British places were taken up in about 20 minutes – this is a British phenomenon – no other nation is so keen to fork out thousands of pounds to be 'beasted' around the Sahara desert in the midday sun. About 230 Brits departed London Gatwick on 31 March for Ouarzazate (Morocco). The British numbers now rival the French competitors and about 48 other nationalities were represented during the race; it is always a very international event. We have donated another £10,000 to St Catherine's Hospice in Crawley to support the excellent Community Nursing Service which is providing at any one time care for over 500 patients and families in Mid Sussex. 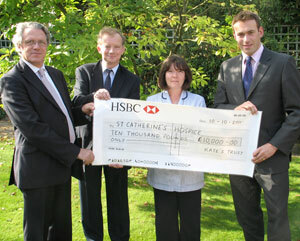 We have made our first substantial donation of £10,000 to Chestnut Tree House Childrens' Hospice. Located near Arundel, this is the only hospice in Sussex caring for children with cancer or life-limiting illness. This centre is a beacon of hope and is currently caring for 227 children. It needs £6850 per day to cover its running costs – especially tough in 2011/12 when the government grant represents 9% of their total direct care costs. On the journey back from a happy family week-end by the sea at West Wittering, on 12th September, Anthea, Simon, James and Adam visited Chestnut Tree House. We were impressed and much moved by the quality of encouragement and care; our happiness throughout a noisy week-end with three spirited children put entirely in its proper perspective. In October 2010 Chris Webb & David Greenwood from Pegasus PR, Worthing climbed Mount Kilimanjaro in Kenya to raise money for Kate's Trust. The second Pink and Purple Ball was held in October 2008 at the De Vere Grand hotel in Brighton and raised more that £15,000 for Kate's Trust. The event attracted 280 guests who enjoyed casino tables and a charity auction. Kathryn Peel raised £1721 by completing the Great North Run in December 2007.